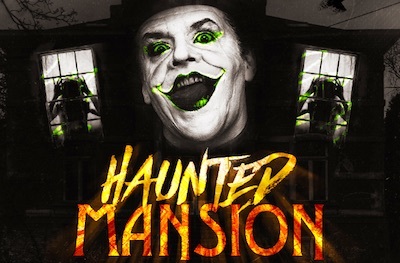 Halloween in Boston 2019 - Ghosts, Graveyards, Gore! Halloween in Boston celebrations start at least a month before the actual event on October 31st. After all, Boston has some of the country's oldest graveyards, haunted tales, and scary events, plus great places to shop for Halloween costumes. 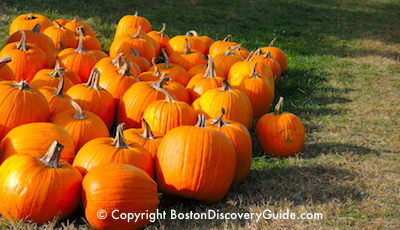 If you visit Boston during October, don't miss these Halloween events! Here are some of the best places to celebrate Boston Halloween . . . starting with graveyard tours and ghost stories. Not just for Halloween, Boston's nightly Ghosts and Gravestones Tour combines a trolley ride with walking to visit the city's scariest sites. Costumed "gravedigger" guides show you the darker side of Boston. They'll entertain you with haunted tales about the city's earliest days and strange discoveries - the mysterious North End tunnels, the unexplained Day of Darkness back in 1780, and the haunting ghost of Boston Harbor, the Lady in Black. And then there's the scariest part of the tour . 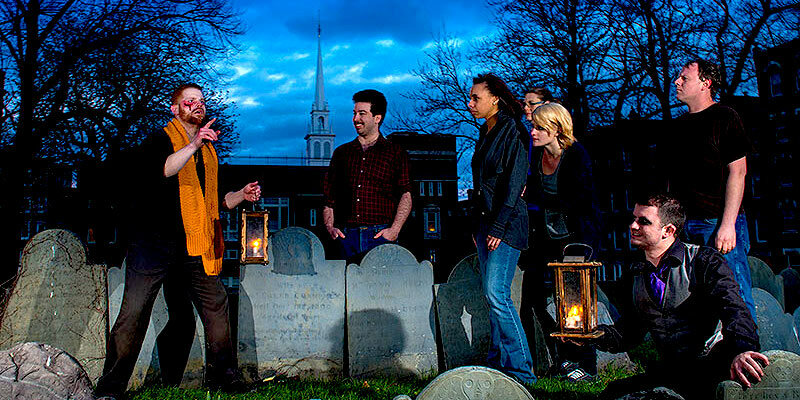 . . a chilling visit to 2 of Boston's oldest graveyards, accompanied by tales of the macabre. 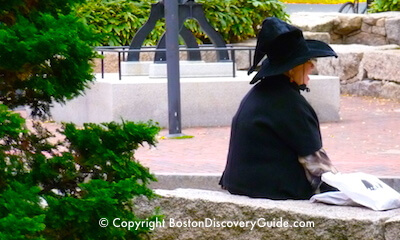 Ghosts and Gravestones tours fill up fast around Halloween in Boston - so make your reservation now! SAVE BIG on half-price and discount tickets to Halloween events, parties, and shows from Goldstar. 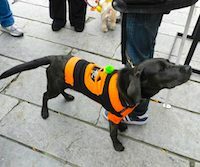 A $20 ticket (proceeds donated to a local non-profit - this year's event benefits Friends of the Port Point Channel) gets you rides on a Boston Duck shuttle departing from Seaport Hotel to all the Halloween parties at The Barking Crab, Jerry Remy's, Atlantic Beer Garden, and more top spots along the waterfront (some bars may charge a cover). Come in costume, and get ready to party! Spend the night or the weekend at Seaport Hotel (check rates & make reservations), and you won't even need a designated driver! 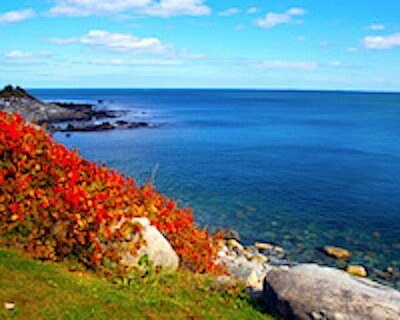 Immerse yourself in witch culture by heading north of Boston to Salem, Massachusetts, also known as the "Witch Capital" after the infamous witch trials of 1692 led to the execution of 20 people and 2 dogs. Numerous historic and entertaining witch museums, historic sites, and appealing restaurants provide more than enough to see and do during your visit. 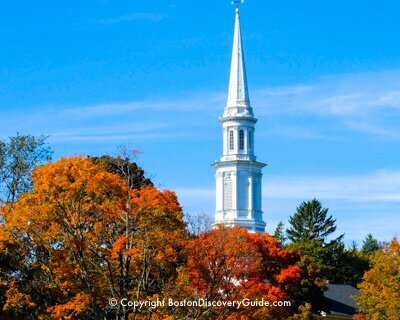 Two easy ways to get to Salem from Boston include a guided day trip (with plenty of time for exploring on your own), or a high-speed ferry from Boston if you prefer to see Salem on your own. Check out Halloween in Salem for more about the witch museums, and save money when you get a combo ticket for the Wax Museum and Witch Village. To find this year's date for Salem's Haunted Happenings Grand Parade, usually held in early October, check the Boston Events for October. Boston pubs and hotels get into the Halloween spirit with prizes for best costumes, live music and/or DJs, and shows. Tickets usually required (call in advance to check); most are 21+. Lansdowne Pub (9 Lansdowne St, Fenway, 617-247-1222) - Apocalypse Party with The Pop Disaster, Oct 26, band plays at 10pm - prize goes to best zombie apocalypse costume - 21+. Halloween Ball with The Beat Drops on Saturday, Oct 27, band plays at 10pm - costume contest - 21+. Spooky Trick or Treat Brunch on Sunday October 28, 11am-4pm. Wear a costume and get a treat. Loretta's Last Call (1 Lansdowne St, Fenway, 617-421-9595) - Pumpkin Carvin' Party - Monday, October 22 - $15 includes pumpkin, carving kit, 1 pumpkin beer, and toasted pumpkin seed snacks, with prizes, giveaways, and live music starting at 7pm. 21+. Tickets: https://www.eventbrite.com/e/pumpkin-carvin-party-tickets-38092796580. Puppy Patio Party: Halloween Edition - Sunday Oct 28 - bring a furry friend in an Halloween costume (and come in one yourself); treats, giveaways, brunch specials. Beacon Hill's historic homes display some of the most colorful and lavish Halloween door and window decorations in the city. You can easily stroll through the neighborhood on your own - Chestnut and Mt Vernon Streets are great starting points. Of course, you can take these tours throughout the year, but seeing the colorful and creative Halloween decorations adds to the fun! Look for storytelling, magicians, refreshments, and more at the star-shaped fort ... supposedly the inspiration for "The Cask of Amontillado," Edgar Allan Poe's famous chill-filled short story. 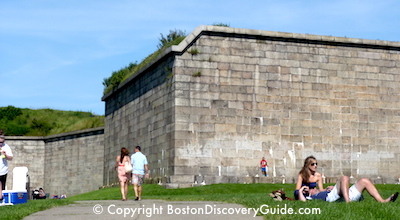 The Castle Island events take place between 12 noon and 4pm on both days, weather permitting. Children MUST be accompanied by an adult. Free admission. 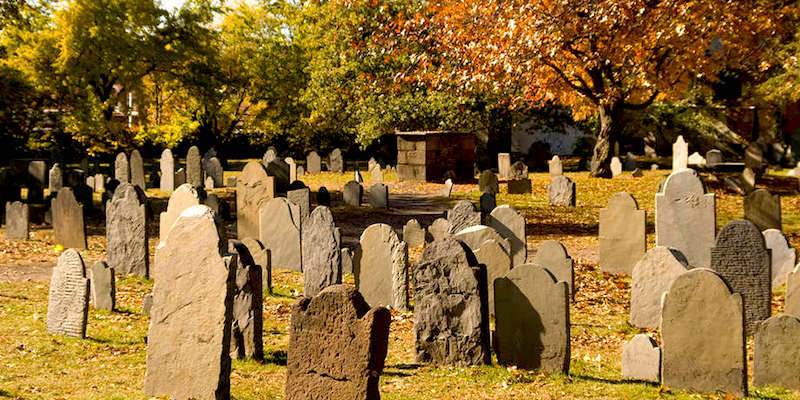 Are Boston's Puritan-era burying grounds dating back to the 1600s actually haunted? 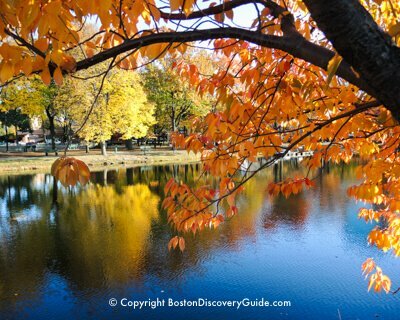 Stroll through a couple of these Freedom Trail sites, and decide for yourself. 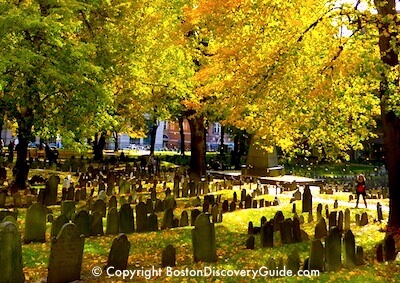 Granary Burying Ground contains the remains of some of the greatest Revolutionary War heroes including Samuel Adams, Paul Revere, and the 5 Boston Massacre victims. A block away is King's Chapel Burying Ground, Boston's oldest cemetery. Many of the first generation of English Puritans who settled in Boston are buried here. Be sure to check out the intricately carved seventeenth century headstones embellished with skulls and crossbones, and depicting Time wrestling with Death. And, if you enjoy scary ghost stories, King's Chapel Burying Ground is supposedly haunted by Captain Kidd, hanged for piracy in 1701. Of course, like many other Boston Halloween tales, that story may not actually be true. Detailed signs at both graveyards will help you discover where all the bodies are buried. 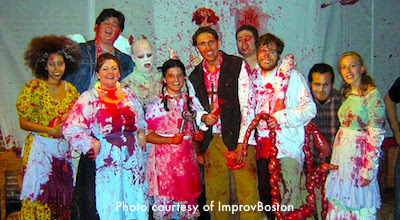 ImprovBoston's GoreFest - "XV: Horror House"
Each year, ImprovBoston creates a new over-the-top musical comedy full of squirting blood (aka red corn syrup), juvenile humor, tasteless dialog, and catchy tunes to entertain and gross out Halloween fans. You may possibly even detect satire and mockery. Expect plenty of flowing blood and possibly flying guts, not all of which lands on the actors. Don't wear your good clothes. In fact, bring a poncho if you have concerns about what might land on you because something probably will. ImprovBoston's Halloween romp aspires to be inappropriate for people of all ages, and therefore is not for children, the squeamish, the easily offended, or anyone who insists on good taste or decency. But if you love this kind of comedy, not just for Halloween, get your tickets now. And you may also want to check out other best Boston comedy clubs. 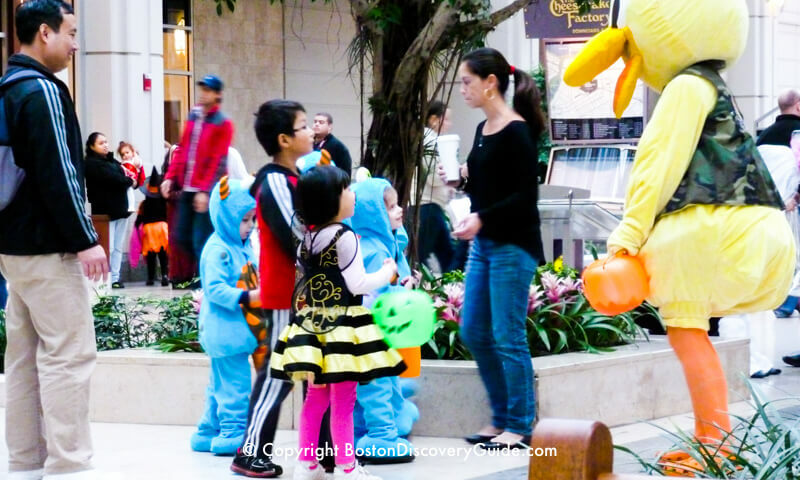 If you're looking for a family-friendly Halloween event in Boston, Pru Boo is the biggest Halloween party in the city for toddlers to 12 year olds. The Shops at Prudential Center host this beloved annual event, with over 50 participating stores and restaurants. All proceeds go to a non-profit partner to benefit children. Let your children don their scariest costumes and bring them to this safe and fun event featuring costumed characters, concert, pumpkin decorating, trick-or-treating, face painting, magic shows, and much more. New this year will be non-food trick-or-treat items for those looking for an alternative to candy or who might have food allergies. For a small donation, your child gets a trick-or-treat bag to fill with candy from participating stores around the mall. 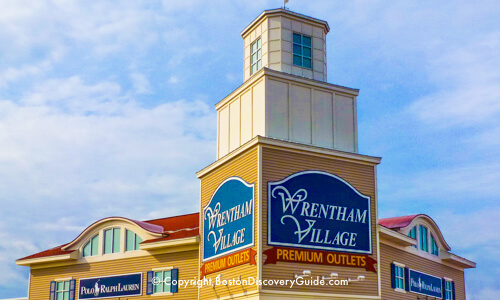 They'll have tons of fun, you can browse for great shopping deals, and Boston's children who need help the most will benefit. Get Creative at 75 Chestnut's Pumpkin Fest! Carve, paint, and decorate your pumpkin, and then take it home with you. Reservations required - 617-227-2175. The pumpkins are complimentary - but plan to indulge yourself with some of 75 Chestnut's special fall fare - pumpkin bisque, cranberry apple crumble, and for the grown-ups, the special appleand pumpkin martinis made from locally-grown produce. 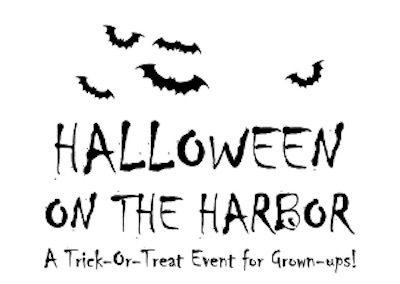 On October 31st starting at 5pm, 75 Chestnut and 75 on Liberty Wharf invite visitors to stop by in costume and enjoy various Halloween specials and wicked witches brews at their Haunted Happenings event. 75 Chestnut is owned by Thomas Kershaw, who also owns the "real" Cheers (also known as the Bull and Finch) on Beacon Street and has done much through the years to benefit and improve Frog Pond across from Beacon Hill on Boston Common. During the weeks before Halloween, Boston party-goers and power shoppers head across the river to the Garment District (200 Broadway at Portland Street intersection; Central Square T station) in Cambridge for budget costume choices. Vast array of recycled costumes, retro fashions, and vintage gems, plus you'll also find a great assortment of wigs, swords, masks, body paint, and other Halloween gear in the month or so before Boston's favorite holiday. 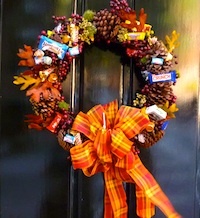 Cheap prices - so you'll still have plenty of $$s left for buying candy. 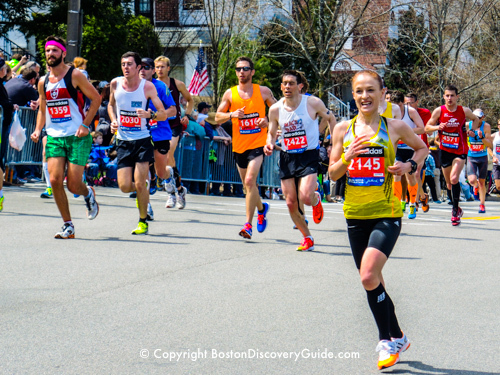 Insider tip: Go early to beat the crowds and get the best selection. Open daily; call 617-867-5230 for hours. 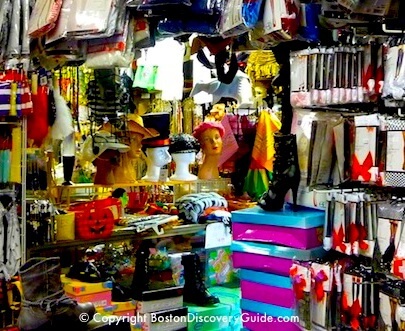 Dorothy's (190 Massachusetts Ave, near Huntington Ave) packs in a huge quantity of costumes and accessories on every aisle, floor to ceiling. Dorothy's almost bursts with every costume and accessory imaginable - hats, fake mustaches, wigs, costumes, cheap cowboy boots, outrageously fake jewels, and stilettos - almost all with reasonable prices. Most costumes are for adults. 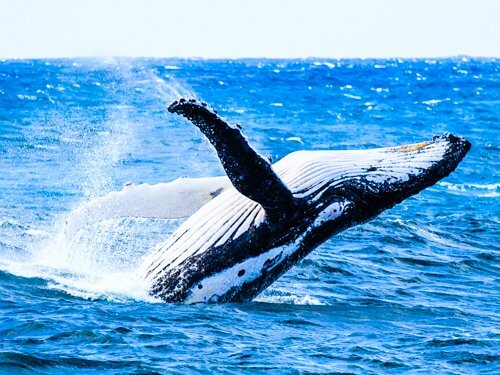 You'll want to hit the gym before strutting around in many of them. Don't bring your children unless you want to explain x-rated details. This family-owned shop has been here since 1947, and Boston is a more interesting place to party because of it. Open daily; call 617-262-9255 for hours. Do you and your pet love to dress up and strut around? If so, bring out your favorite Halloween costumes for both of you, and head over to Faneuil Hall Marketplace on October 27 from 12 noon to 2pm to show off your holiday spirit. You and your pet could win one of 6 top prizes! Categories include Best Owner and Pet Combo, Best Local Boston Representation, Most Creative, and Top 3 Best of Show. 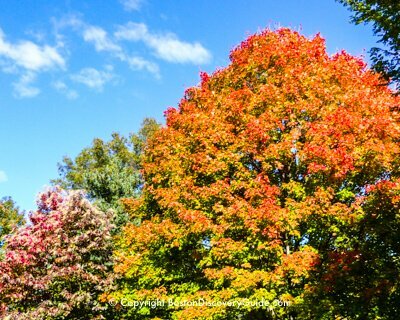 Halloween Events in Salem - Find out why Salem is called the "Witch City"